Christmas Eve is unique among all vigils. Joyous anticipation fills the hearts of both child and adult, and all the Christian world has tried to express this sentiment in a superabundance of images, customs and traditions. It would be impossible to consider all of them. 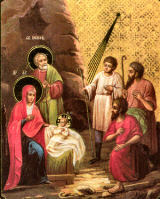 Not only nations but even individual families have devised splendid little customs to celebrate Christmas. Culinary art has exceeded itself at this season. Since tomorrow is the feast, the greater portion of the cooking must be done in advance. Swiss krabeli, Greek malachrino (spice cake), and German lebkuchen and stollen would delight the hearts of all. The very shape of stollen is supposed to represent the Christ Child, and the folds on top of the loaf swaddling clothes. Lebkuchen or life cake is an excellent reminder of the Bread of Life. Among English recipes are to be found everything from boar's head to plum pudding, with accent upon hot buttered rum and eggnog. Polish Wigilia Since the vigil was traditionally a fast day, fish is in order. Whereas in Brittany the codfish takes the honors of the day, American custom associates piping hot oyster stew with Christmas Eve. Sponge cake or an Italian cream tart would make an excellent dessert, quickly prepared by the older girls. The Polish Christmas Eve supper, called the wigilia, is perhaps the most complicated culinary celebration of the vigil. In the homes of that country stalks of grain are placed in the four corners of the dining room with a prayer for plenty in the years to come. Then bits of hay, symbolic of the manger in Bethlehem, are strewn beneath the tablecloth, which must be hand woven. The youngest child is set to watch for the first star of the evening, and when it appears he runs to tell the rest of the family. Then supper begins, as tradition has ordered it, with the breaking of the oplatek, a semi-transparent unleavened wafer made in an iron mold and stamped with scenes of the Nativity. Each one at the table breaks off a piece and eats it as a symbol of their unity in Christ. . . . The soups are three in number, followed by three fish dishes accompanied by noodles, cabbage and dumplings. The desserts are also three, one of which is always a fruit compote with twelve dried fruits symbolic of the Twelve Apostles. At the end of the supper, carols are sung and presents are exchanged. The remainder of the food is often given to the animals in the hope that all living things may prosper by the food served in memory of Our Lord's first night on earth. Christmas Decorations The opening of the eternal gates through which the King of Glory may enter is indicated by the wreath on the door of our homes at Christmastide. The Advent wreath, which accompanied the family throughout the season of preparation may be taken down. The violet ribbons are removed, and it is gloriously decorated with white and gold. It is then placed upon the door as a symbol of the welcome of Christ into our city, our home and our hearts. On Christmas Eve the whole house should be strewn with garlands and made ready for the Light of the World. The crib is set in a special place of honor, for tonight the central figure of the Nativity scene is to arrive. The Light of the World—The Christmas Candle The Jews celebrate their feast of lights (Hannukah) during the month of December in honor of the rededication of the Temple. Tonight we celebrate the arrival of the Messias who is the light and life of the world. The liturgy itself has preserved the symbolism of light as representative of the Redeemer, and this is most dramatically brought out in the blessing of the paschal candle at Easter. On Christmas Eve, a huge candle is set up in the home. It was often the custom to surround this candle with a laurel wreath, symbolic of victory over Satan, and then to keep the light burning throughout the holy night and every night during the festival season. Nearly every nation has adopted the Christmas candle. In Ireland the family lights a holly-bedecked candle and prays for the living and the dead. The Ukrainians place their candle in a loaf of bread, reminiscent of the Bread of Life and the Light of the Nations. In South America the candle is sometimes placed in a paper lantern decorated with Nativity scenes. In France the Christmas light often consisted in the molding of three individual candles into one at the base in order to give honor to the Most Holy Trinity. In Germany the Christmas candle was sometimes placed upon the lichtstock, a wooden pole decorated with evergreens. The pyramid of candles which later became customary was replaced by the Christmas tree during the seventeenth and eighteenth centuries. Posada The Spanish Posada (the Inn), is traditional in South-American countries, especially Mexico. On an evening between December 16 and 24, several neighboring families gather in one house, where they prepare a shrine, handsomely decorated, and beside it a crib with all its traditional figures, but the manger is empty. At night a priest comes to the house, reads prayers and burns incense before the pictures of Mary and Joseph. Then a procession is formed, the two images carried at the head. The group moves through the house, reciting a litany and chanting hymns until it reaches a room on the top floor where a carol is sung in which St. Joseph begs for a shelter. The people stationed within the room respond, refusing St. Joseph's request as part of the carol. The procession then proceeds to the place where the altar has been prepared. Pictures of Joseph and Mary are put in the shrine, venerated with prayer and incense, and all those present are blessed by the priest. Thus the religious part of the Posada ends. Then comes a gay party for the adults consisting of games and refreshments, while the children are entertained with the piñata. This is a fragile clay jar suspended from the ceiling and filled with candy and other goodies. The object is to break the jar with a stick so the contents spill and everybody rushes pell-mell for some of its treasures" (The Christmas Book, by Francis Weiser, SJ). Let us be as Christ, for Christ is also as we. Let us become gods for His sake, for He also was made man for us. He took upon Himself what was poorer that He might give what was more glorious; He was made poor that we might be enriched by that poverty; He took the form of a servant that we might be set at liberty. He descended that we might be elevated. . . . Let everyone give all things; let him offer all things to Him who gave Himself as the price of redemption for us and as a recompense for our fault. But he can give nothing as great as when, rightly understanding this mystery he offers himself and becomes for the sake of Him everything which He has become for our sake (True Christmas Spirit by Rev. Edward J. Sutfin, ©1955 by St. Meinrad Archabbey, Inc.).